Granted, the apologies are getting a little old. However, on top of combatting jet lag for the past week, I also spent my weekend in the Land that Time Forgot (a.k.a. my grandmother’s house, where internet is entirely absent). But I am fully yours, once again – and yes, I can hear your sighs of relief from my little corner of the UK. 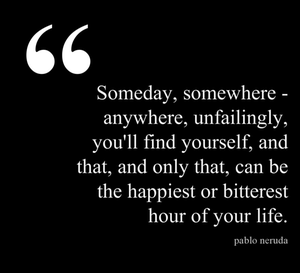 This week’s Monday Musing comes to you courtesy of my very favourite poet, Pablo Neruda (you can see more on that particular obsession here).